In a bit of access only possible during Spring Training, MLB umpire Ted Barrett granted an interview with Angels broadcaster Jose Mota during Thursday night's game against Chicago (AL) at Tempe Diablo Stadium. Crew Chief Ted Barrett has an in-game Q&A. Barrett, who officiated Thursday's game alongside plate umpire Ramon De Jesus, Bruce Dreckman, and former regular season crew-mate Alfonso Marquez, told Mota of the umpires' spring routine, explaining how umpires are assigned to Arizona or Florida (A: generally, by proximity to residence), when the field umpires switch bases during the spring (A: crew chief decides, usually switch bases every two innings), and educating players and managers about rules. Barrett also discussed working with younger officials and complimented his game's plate umpire, De Jesus, saying, "A guy like Ramon, he's tremendously talented. The older guys bored into me some wisdom, some knowledge, so I feel like it's my responsibility to bore it back." 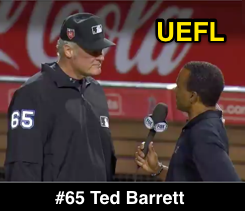 Ted Barrett is the UEFL's most decorated umpire, having won seven total postseason awards, including Crew Chief of the Year (2014, 16, 17), Honorable Umpire of the Year (2012, 13, 14), and Best Umpire of the Year (2014).